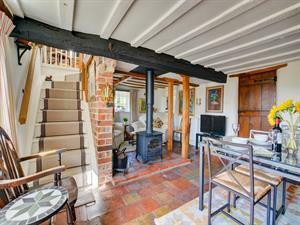 Old Beams01263 715779work01603 870304fax Self-cateringThis characterful and spacious cottage is based on the beautiful North Norfolk coast. With beams and exposed brick walls, along with the wood burner and roses around the door, this cottage really is charming. The village hosts a good pub and local store that showcases Norfolk produce, both of which are walking distance from the cottage. Bird watching, sailing and exploration of the magnificent coastline and its quaint villages are just some of the things to do here, there are spectacular beaches too and plenty of walks to find along the Norfolk coastal path for all the family, including the dog. This characterful and spacious cottage is based on the beautiful North Norfolk coast. With beams and exposed brick walls, along with the wood burner and roses around the door, this cottage really is charming. The village hosts a good pub and local store that showcases Norfolk produce, both of which are walking distance from the cottage. Bird watching, sailing and exploration of the magnificent coastline and its quaint villages are just some of the things to do here, there are spectacular beaches too and plenty of walks to find along the Norfolk coastal path for all the family, including the dog.